Remember the Fiat Sedici? It’s Fiat’s version of the Suzuki SX4, in 4X4 form as the SX4 in the Suzuki stables is available both in hatchback and crossover four wheel drive form. 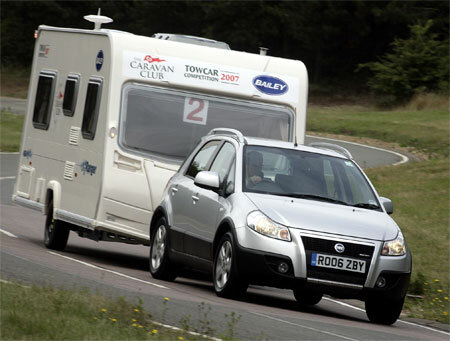 The Fiat Sedici recently won the an award in the Caravan Club Towcar of the Year 2007 Competition, pwning competitors like the Daihatsu Terios 1.5, the Kia Magentis 2.0 CRDi GS Manual, the Nissan Note 1.6 SVE and the Vauxhall Meriva Active 1.3 CDTi. The Fiat Sedici comes in either a petrol or turbodiesel engine – a 107bhp 1.6 litre petrol and a 120bhp 1.9 MultiJet turbodiesel, mated to a 5 or 6 speed gearbox respectively. More details on the Fiat Sedici by clicking here.